Say hello to Microsoft Edge. After many months of referring to the IE-successor simply as Project Spartan, Microsoft has finally come forward with the official name for its next generation web browser. The announcement didn't really reveal much in terms of brand new features, but it did confirm a lot of things that we already knew. You'll be able to group tabs together, for example, and it will have a built-in reader for keeping up with the latest news and updates from your favorite websites. In line with the stylus-happy experience on the Surface line, Microsoft Edge will also have integrated note-taking and sharing features, making it easy for you to annotate webpages and collaborate with friends and colleagues. 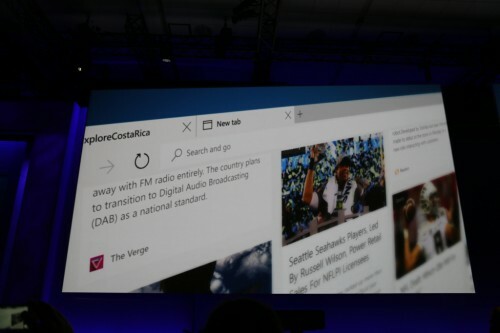 Microsoft Edge will also have integrated Cortana support, live previews of content as you type your terms into the address bar (like weather and stock prices), little preview windows when you hover over your tabs, and a design that focuses "on simplicity and minimalism." The rendering engine being used in Microsoft Edge is called, appropriately enough, EdgeHTML. They say it's a "browser built for doing," whatever that means. In any case, you can check out Microsoft's "teaser" video for the Edge browser below. And remember, Microsoft Edge will be bundled in with the free Windows 10 upgrade later this year. Stay sharp, my friends.